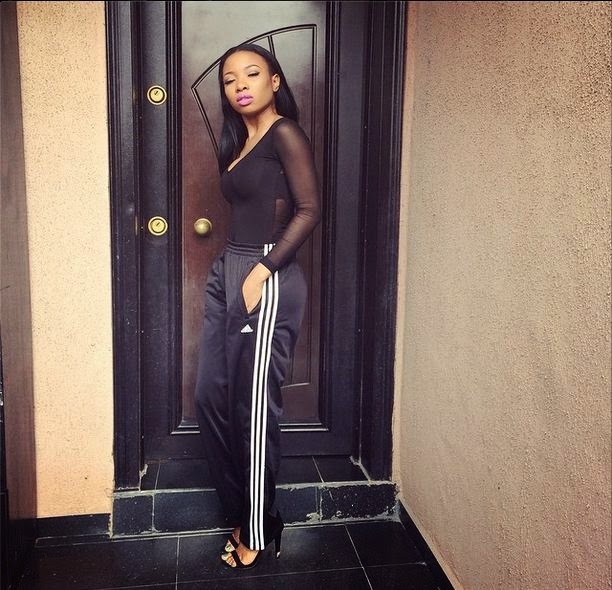 Oby's Blog: Are You Loving Mocheddah’s take on the Sporty-Chic Trend? Are You Loving Mocheddah’s take on the Sporty-Chic Trend? Now, if you follow Mocheddah on Instagram,you will know that apart from posting fun photos from her very busy life, she loves to show off her style. Yesterday the singer put up this super sporty-chic photo on her page and as usual her followers loved it. In the photo Mocheddah is seen rocking a black top with sheer sleeves and back, track suit pants and black shoes. She completed her look with long hair swept to the back and bold pink lips. We think she clearly knows how to put pieces together, but BN Style Watchers what do you think? Love her look?